These are just a few of the sweet treats that come out of our bakery kitchen. Hand-baking in small batches is a time consuming business but we feel the rewards outweigh the effort in the taste department. If you ever wonder why our ‘traybakes’ sometimes look a bit irregular or have a corner missing it’s because we don’t have a machine to do it, they’re all cut by hand! We also make most of the classic desserts… Lemon meringue pies, Strawberry cheesecake, Fresh Fruit Pavlovas, Apple pies, Fruit crumbles and for even more indulgence how about Lemon Roulade with home made Lemon cheese or Sticky Toffee pudding with custard or Vanilla ice-cream. One of the most popular items on our menu is our Scones. They’re the first thing we bake each morning available in Sultana, Cherry and savoury Mature Cheddar & Pumpkin seed. They’re out of the oven each morning by 9:30 and often sold out by lunchtime. 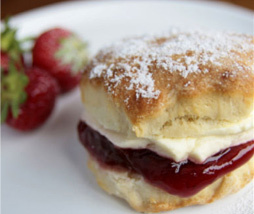 The ‘Scon’ or ‘Scone’ creates heated debate as to the correct pronunciation. I like to think this poem clears matters up (somewhat)!